The top voted idea in the Community this week is one the request to "Show SQL". This idea does have a few different solutions to utilize for finding the SQL sent to data sources so be sure to read the comments on page two and visit this KB article: https://kb.tableau.com/articles/howto/viewing-underlying-sql-queries-desktop Your votes and comments are welcome on all Ideas so be sure to visit Ideas. Woot! Did you notice that an idea created way back in 2012 by Shawn Wallwork has a status change to "Planned". The idea Ability to Disable the One-Click Sort is now in planning. Persistence and 771 upvotes votes are making this request a reality. Thank you for your votes and comments. Keep your eyes out for this hitting Beta soon. Community member Caitlyn Garger brings us this weeks most viewed thread on the topic of Normalization/Standardization. Caitlyn's question is about normaling two different lines to better understand the relationship of the values when the axis minimizes the value/impacts of one of the lines. 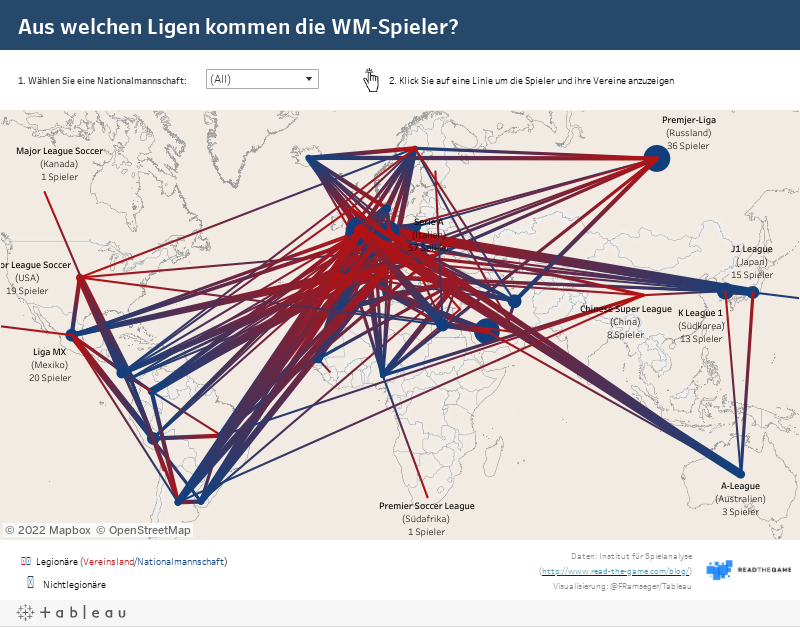 Aurélien Vautier contributes a reply suggesting the use of a dual axis to better show the two lines and user Tim Dines shares a more detailed view utilizing a few other aggregation models and the use of shapes with commentary in the visualization. Finally, Michael Hesser suggest even a few more options to compare the lines as well as methods to swap between different views. The community provided all of these replies within a couple hours of the original post. Thank you Aurelien, Tim and Michael. The most viewed thread this week started off a few weeks back with a post by Wilfred Eze titled Help on mapping population census blocks using dynamic radius filter . It's worth a great read to see a long time Tableau Community legend Richard Leeke and Tableau Employee, Sarah Battersby, and brain of all things maps come together to assist Wilfred. If you missed this post, you will want to check it out. This post exemplifies about how the community will not let you fail. Thank you to Richard, Sarah and all that have contributed on this very challenging question. Many new to the forums might miss this great resource: Getting Started in the Forums . Check out our 'Required Reading' section + Packaged workbooks: when, why, how and Resolving Issues in the Tableau Community . Join the conversation on this thread and let us know if these resources are helpful - or if there are any more we should highlight. The top voted idea in the forums this week remains Control what displays in View Data. Thank you for the feedback and votes on this one. The second top voted idea this week is Timezone personalization for Tableau Online subscriptions - please add your comments on this one for any clarification as we are engaged to update the idea this week. + Zen master and Ambassador, Shinichiro Murakami , has joined forces with several Tableau Zen Masters and Ambassadors to encourage the community to create visualizations to introduce Japan to the rest of the world on Tableau Public with a project titled #vizitJapan. Happy prepping, vizzing and analyzing! Have you ever used transparent sheets? Here is a great viz from Jacob Olsufka where you can follow along bat by bat of the 2018 World Series and explore likelihood of winning for each team as events occurred and the use of a user guide that appears on demand to explain how to use the viz. 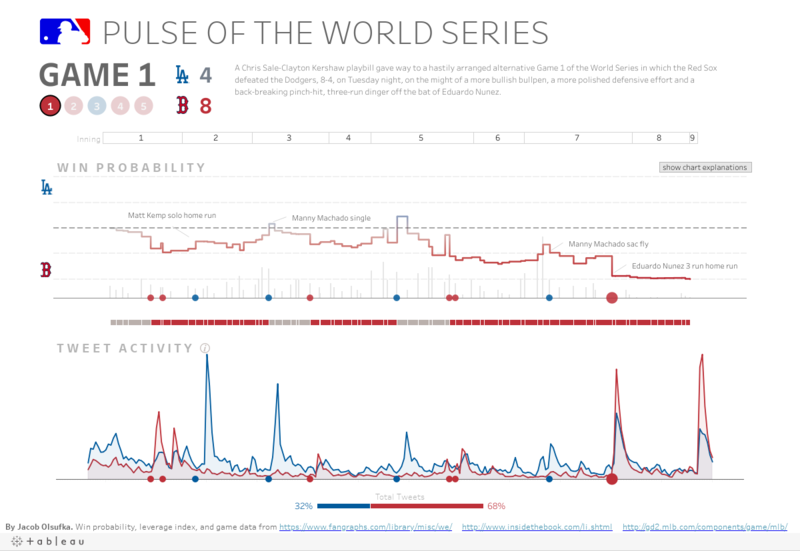 Download the workbook and see if you can learn some a new twist on how to make a magical visualization that explains every detail of the world series in a single dashboard. Thank you for sharing Jacob! + Zen Master Chris Love recently competed in a Viz-Off highlighting different products including Tableau. He shares his thoughts and the visualization he created on his recent blog: How do you choose a Bi Tool? The most talked about thread in the forums this week was Difference between two columns by Adam Elbayar. Several users assisted Adam initially by showing how to create a table calculation showing difference in a new row but Adam was looking for a Total that showed the value. Paul Wachtler assisted with a Table Calculation that uses the last() and first() functions to difference between two columns as a new value. In addition, Adam learned about aggregate calculations with strings and the use of the attr() function. The top voted idea title this week goes to Control what displays in View Data created by Darrin Schulte. This idea was created back in 2012 and while many use techniques to export CSV files such as The Greatest Tableau Tip EVER: Exporting Made Simple!. You may still want to see the view data with more control. Be sure to vote on the Ideas that most matter to you. Akram Ebrahim and Ombir Rathee both received the Questions for Breakfast! badge for having 24 of their replies marked Correct! Paul Wachtler achieved the I love helping! badge for having 25 replies marked helpful in the Tableau Community Forums. Achieving the Helpful is my middle name badge this week is Ombir Rathee for having 50 replies marked as helpful! You all are data rockstars. Have a great week. I hope everyone has had a chance to get rest after an amazing Tableau Conference 2018. I want to start off with a huge thank you to all of you that stopped by and introduced yourself in person to our team working the Tableau Community area of the Data Village. We enjoy talking to you and meeting the people behind all this amazing content. We have several links to share with you if you missed Tableau Conference or just want to relive the experience. The Community has much more to share this week with all that inspiration coming out of conference. The most talked about thread in the forums this week was Extract Filters posted on October 25st by Vibhu Sharma. Thank you to Akram Ebrahim and Maneesh Gaddam for helping Vibhu to understand the differences between Extract filters vs a Data Source level filter to a dashboard. It appears this is helping out a lot of the other members of the community based on the 1400 plus views this thread has received this week. The top voted idea this week is to https://community.tableau.com/ideas/8714 . This idea was created by Jonathan Drummey and relates to adding the row numbers or the Index() function to Tableau Prep. Would you find this feature helpful as well? If so, be sure to add your vote to this great idea. Wow so only 2 weeks until Tableau Conference. Will you be attending? The Tableau Conference App is now available for download. Download now and start planning your #TC18 experience. Speaking of #TC18. Have you earned a badge in the community for helping other members of the community? Be sure to pick up a sticker version of your badges to show off your accomplishments. Not sure which badges you have earned, go check them out by selecting View Profile next to your name and then from the Profile screen, select the "More" drop down on the profile screen to get to "Your Reputation" where the Missions options will appear. Missions will show you every badge that you have completed in the Forums. There are still a very small number of spots left for Conference so if you have not registered to attend, do it today: Register for Tableau Conference! You can keep up on all things Tableau Conference by following the #TC18 hashtag on Twitter. + Tableau's own Andy Cotgreave has posted a recap of the best of the last 6 months of what the Internet has to offer about Tableau. 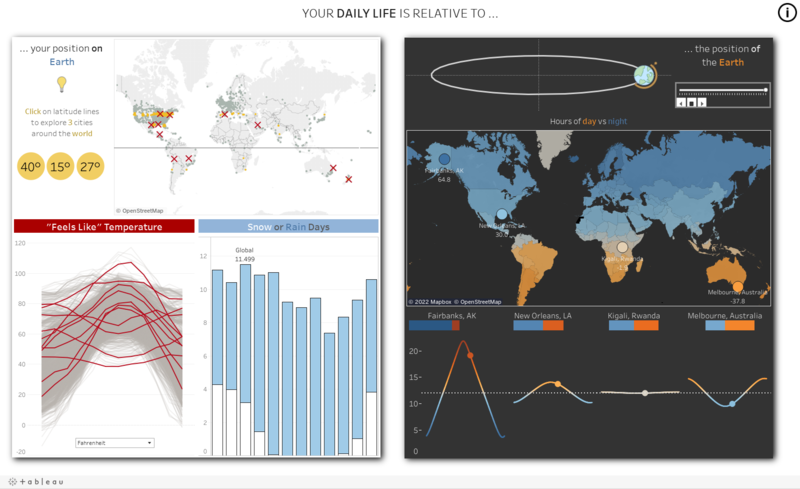 Best of the Tableau Web: Steam graphs, visualzing music, string calculations, and more. + Tableau Prep has some new tricks to share. Product Manager Maraki Ketema shares whats new in the article: 2018.3.1 release in New in Tableau Prep: Cleaning improvements, database wildcard union and PDF connector. The most talked about thread in the forums this week was Year over Year Bar Chart w/ dual axis line chart posted on October 4th by Randy Colanta 18th. Tableau Forum Ambassador Shinichiro Murakami helps Randy through some back and forth with a sample workbook to create bar charts to parse his data by month and then compare over time. Finally Shin helps Randy with a bit of formatting for his view in a dual axis chart with lines and bars. Do you have a vote or comment for this idea? if so, be sure to vote*. Tableau Conference has something for everyone and the whole community is excited for #TC18. Don't wait for conference to follow along and prepare. Take Jeremy Poole's Survey here #TC18 New Orleans - Attendee Info and then jump over and see how you compare to the rest of the community. Have a safe travel to New Orleans. See you soon. Welcome to the Community Digest! Last Thursday, we had the great honor of hosting Simon Runc for the Tableau Community Group, Think Data Thursday. Simon presented on the use of Action Filters with Tableau and showed us some advanced techniques to get the most out of this feature. He also shared with us a peak behind the curtain into an upcoming beta version of Tableau and how we will be able to extend the power of actions with Button Navigation. If you missed the presentation, you can watch the presentation here: Think Data Thursday - Lights Camera Action with Simon Runc - YouTube . + We will be performing maintenance on our licensing infrastructure on September 15th from 1:00 am to 3:00 am UTC (6:00 PM PST on Friday, September 14th). New activations and registrations will be unavailable while this maintenance is being performed. Please see our Trust page for details and updates. + The Tableau Self Service team would like to hear from you about improving the landing experience for Tableau Server and Tableau Online. #HelpUsHelpYou by visiting their online survey and answering a few questions. Congratulations to suman kumar this week for achieving the badge "Helpful is my middle name" for his contributions that have achieved 50 votes as helpful in the community. The most talked about thread last week comes from Simone Antorini who asked about how to modify a view when the Percentage goes over 700% so as to show a total of 100% instead on the range in the axis. Hari Ankem jumped in immediately to assist and ask for a workbook to better understand the challenges faced by Simone. amar savale provides the first example but the working solution is provided by Mahfooj Khan with the use of LOD calculations and context filters and this is the post marked correct by Simone. The Tableau Community achieves again! Thank you Hari, amar and Mahfooj. This week's top voted idea is originally crated by Russell Lamb is Apply number formatting inside a calculated field. This idea relates to the suggestion to offer a conditional method to format numbers differently depending on a condition. Thank you for your votes. + If you have not seen it, check out the article from Marie at the Medium about her experiences with Iron Viz in Europe and Makeover Monday. We encourage you to check out this great article here. + There is still time to contribute to the conversation. In advance of Lorna Eden & Sarah Bartlett's TC18 talk "The A-Z of the Tableau Community", they are asking for input from Tableau Community members on what the community means to you & how you first got involved. Link to survey: Tableau Community Survey. Please consider taking part and sharing your thoughts. Welcome to the Community Digest for the week of July 23rd. I hope you are enjoying your summer and any vacations that you have lined up. Have you visited Seattle, the home of Tableau HQ and where most of your community team forum administrators reside? Trying to find just the right month to avoid the rain or maybe you want to come here and cool down from that hot summer in Texas. Be sure to check out the visualization from Data Duo (Adam Crahen and Pooja Gandhi) before you plan that trip to find just the right time of year for your precipitation and heat expectations. 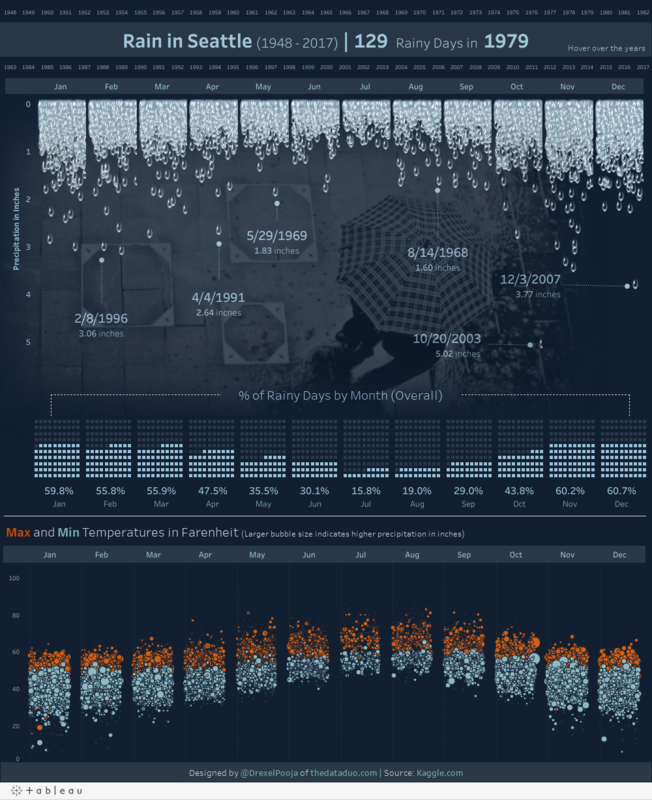 Maybe your city has a visualization related to temperatures and precipitation? 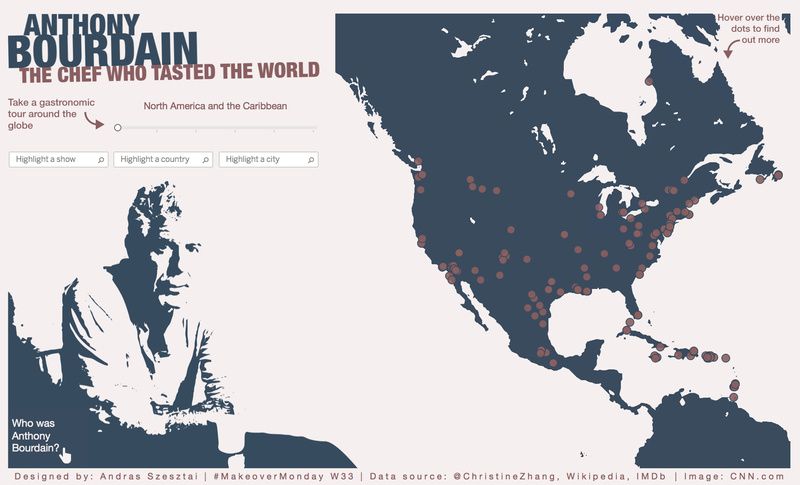 Search Tableau Public and if you don't find a viz, maybe the one here will inspire you to make your own. Thank you to Pooja and Adam!! hundreds of helpful replies to questions for users just getting started to some of the most challenging and advanced questions in the community. I want to thank each of them for their contributions and welcome them to the Ambassador club. + Have you wanted to up your game with Tableau but you don't have time to get away to full day training sessions with our Tableau training team? Well Tableau Virtual Training might be just the thing for you. Tableau trainier, Kristee Bingham provides an inside look at Tableau Virtual Training in the Tableau Blog this week. Workbook & Calculation Library. Be sure to check them out. + The top voted idea for this week is related to Tableau Prep. Tableau Prep - add ability to schedule flows originally posted by Jennifer Vogeler and gaining votes every week. Thank you for your continued engagement and votes! This idea has 615 votes at present. Have you used Prep? Let us know your thoughts by visiting the idea and voting up/down the idea. We appreciate your comments and ideas about how to make each feature work best for you. + As Amanda mentioned last week, the third and final feeder for Iron Viz opens on Monday, August 1st and closes on August 28th. Check out this link for details! 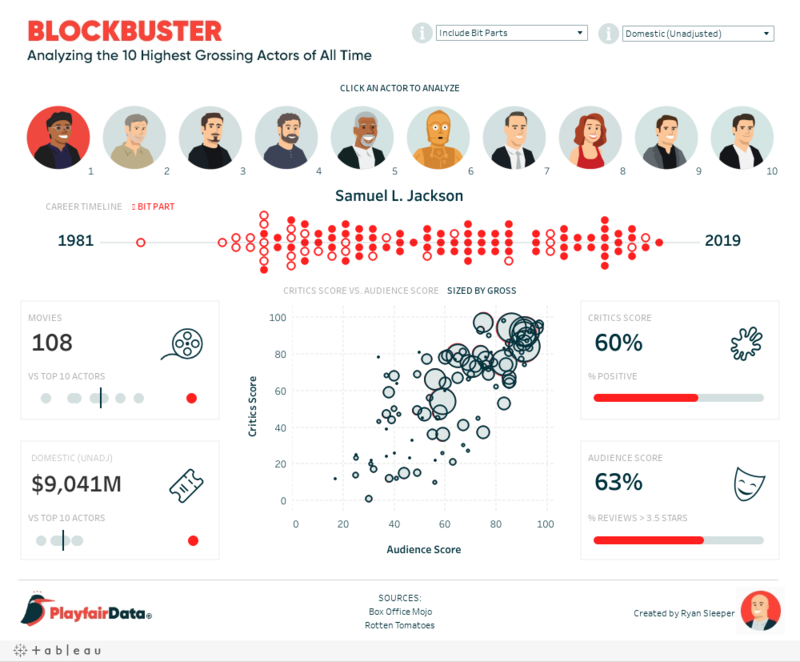 +Do you ever get stuck trying to find the perfect viz type for your data? 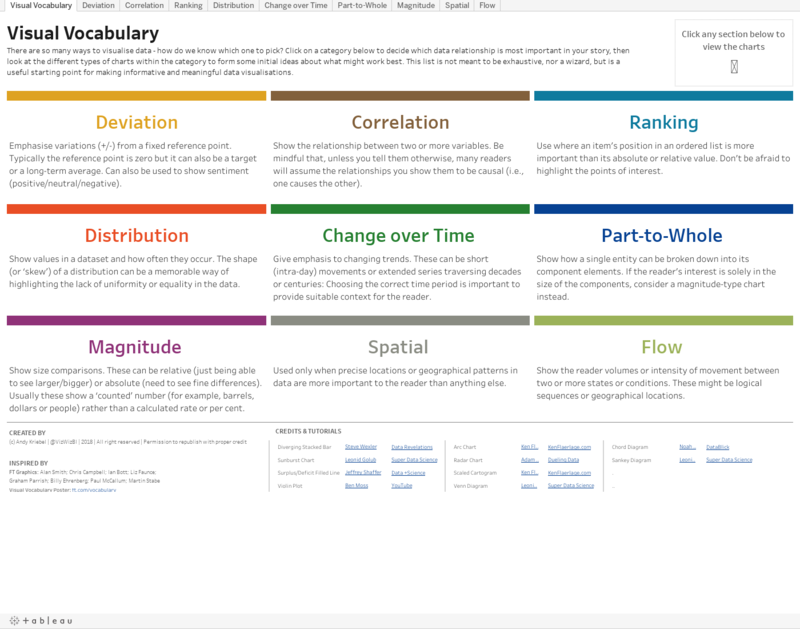 Well this week, Zen Master Andy Kriebel is here to share his Visual Vocabulary If you are new to Tableau or have been using it for years, you will find this helpful reference guide a time saver and go to guide for nearly any viz you can imagine. Bookmark this page today and visit often. Tableau Conference Europe starts tomorrow, July 3rd. For those attending the conference, please share your stories of Tableau Community with others. You can join the conversation on social media by using the hashtag #TC18Europe. If you can not attend the conference this year, Tableau will be streaming live from London. You can find the schedule of events and set reminders by clicking here. Here in the US,we are excited to celebrate the 4th of July this week. I thought it would be a great time to revisit Zen Master Anya A'hearn's blog post Design Your Data Viz Like a product Designer. Anya created this post back in October of 2013 and shows how using Tableau is a creative and iterative process. This post provides inspiration to spice up your visualizations. + As mentioned last week, the Community Founders Award—inspired by individuals like Michael Cristiani who embody the spirit of the Tableau community will be awarded an all-inclusive trip to #TC18. Nominations will be accepted until Friday, July 27, 2018 at 12:00 PST. + Speaking of TC - Iron Viz Global Feeder #2 is accepting submissions! + Our most talked about community thread this week comes from Haan Haan. Haan asked about comparing a measure value for today to a value from the most recent day before today in this thread. Haan provided a sample workbook which enabled Amit Narkar to jump right in and assist Haan with his question and quickly assist with a resolution and an updated workbook. + This week's top Idea for votes is for Server Administrators to View As Other Users with a caveat noted by a few of our members to mask the actual data in the view for data security reasons. + Gordon Strodel, from Tableau Partner, Slalom, has provided a post to the Tableau Blog to help you get control of your dirty data. Don't sweep dirty data under the rug: A three-part approach to data prep. + And with all this talk of Europe TC18, you may be wondering why people keep going to Tableau Conference, year after year. Full disclosure here, this will be my seventh TC this year! Gregory Lewandowski shares his thoughts on why he keeps coming back in the post I've been to 10 Tableau Conferences. Here's why I keep coming back. The Tableau Community is known far and wide as the model for the Data Driven world because of you. Thank you for making this place rock!! Have a great week! The 2018 World Cup is about ready to kick off. Are you from a country with a team that is not participating this year and looking for a way to learn more about the teams competing (hello USA)? Congratulations to Zen Master Ken Flerlage as he achieved the prestigious "Help one, Help all!" badge for 100 members of the community marking Ken's replies/posts as helpful. Joining Ken this week, Bryce Larsen received the "Helpful is my middle name" badge for 50 members acknowledging their posts as helpful. Finally, Mavis Liu followed up last weeks 'Helpful is my middle name' badge by earning the 'Questions for Breakfast' badge received after 25 replies to questions have been marked as the correct answer. The most talked about thread for last week from Rayvel Lopez titled Count each month greater than zero. Rayvel posted a question seeking a LOD calculation to assist with finding a count of months with charge amounts greater than zero for the last year. Wesley Magee jumped in with the first reply eight minutes after Rayvel posted his question. Ambassador Joe Oppelt jumped in to remind Rayvel that posting a workbook helps the community better understand his data and question. Rayvel added a packaged workbook file to the thread and then several other members of the community joined in to assist until Arvind Garg proposed a datediff calculation that looked at the difference in dates and the charge amount value in a single calculation. Thank you to all that helped Rayvel. This idea ODBC connection for Tableau Prep was the idea with the most votes this week. We welcome your votes and ideas on the direction of Tableau Prep. Please be sure to categorize the Idea with "Tableau Prep" when adding new ideas. Be sure to vote for your own idea and ask others to vote up your idea. 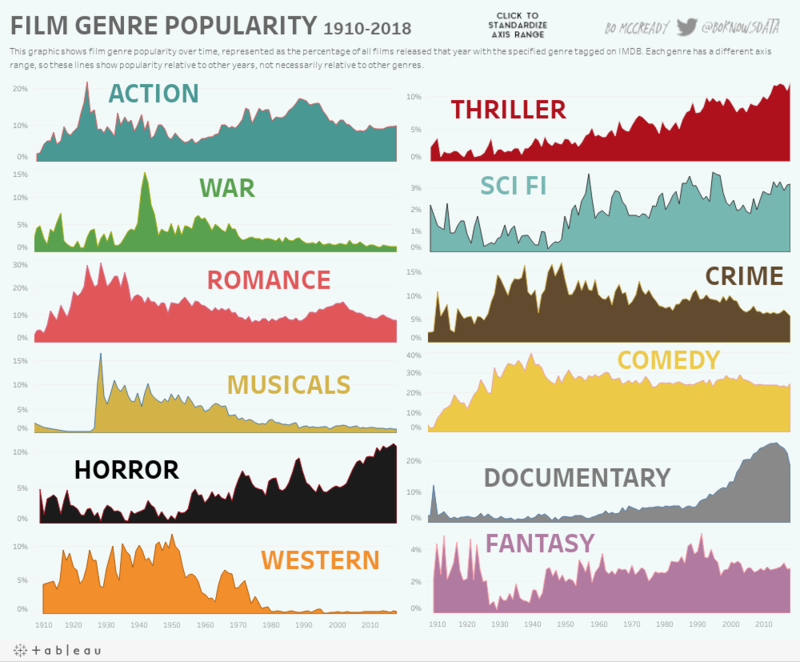 + Andy Cotgreave has posted a recap of the Best of Tableau Web for May, 2018. This is a great way to catch up on many of the best and most helpful posts related to Tableau from May. + There is still time to register for the Tableau Prep webinar with Joshua Milligan & Bridget Cogley covering Tableau Tips and Tricks Round 2 on Wednesday, June 27th! Click on this link to register. + Tableau's own Ed Barrie has posted a blog piece, How analytics helps cash flow management by uncovering key details to provide near real time view of your business. + Want to learn more about the Tableau Community and how to get involved, take a listen to the InterWorks Podcast Your Data podcast where you can listen to this weeks focus on Community with a few of our Ambassadors and Zen Masters followed by an interview with yours truly. + We all have them: data sets that are dragons – from the cute but messy, to the most terrifying malformed monster. But they can be tamed with Tableau Prep! Join Tableau Zen Master Joshua Milligan to learn some techniques, from simple to advanced, to get your data under control in our next Think Data Thursday: How to train your data dragon Thursday, May 31st. This presentation will be recorded and may be watched on our YouTube channel if you are unable to attend. + Are you a Tableau Server Administrator? Be sure to keep informed of Security Bulletins by "Following" the page. We have several new bulletins this week. Did you know you can create new "Streams" to follow in the community from the page - https://community.tableau.com/news. Each Stream can be set up for unique communication options under your User Preferences page in the community. Congratulations to Eric Hammond this week. Eric picked up both the "Helpful is my middle name" badge (50 helpful posts) and the "Questions for Breakfast!" (25 replies marked correct) badge this week. Cathy Bridges and Mavis Liu picked up the "I Know Stuff!!" badges this week for 10 correct marked replies. Thank you to each of you for being rock stars in the community and helping make this the best Community in DATA. The thread How can one choose to include or exclude data with certain condition on a calculated field? was the most discussed thread this week with 16 replies. Bryce Larsen supplied the answer in detail with examples of using a Join rather than data blending to arrive at the solution. Several members of the community contributed ideas to the thread and helped here. What a big week last week here at Tableau. Amanda wrote up all the details on the release of 2018.1 Tableau offerings. If you missed that version of the digest, be sure to check it out here. We hope you are enjoying Tableau Prep. We have created a new home in the community forums to ask questions and discuss this new product release. Be sure to visit to find a list of resources to get started: Tableau Prep. + Beta 2018.2 is now available Now that the party is over we will shift our focus to the next release. Join the Beta today if you want to be the first to see these features in action.. Here are a few of the many new features in this Beta. A complete list of the new features can be found here but here are a few highlights of these from the ideas you created in our community. Logarithmic scale on axis - no negatives allowed! Congratulations to Jennifer VonHagel for achieving 100 helpful votes and the 'Help one, help all!! badge. 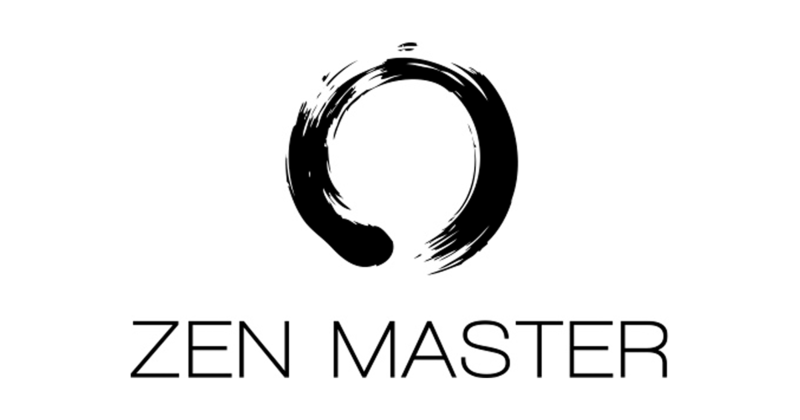 Congratulations to Zen Master Ken Flerlage for achieving the 50 helpful badge 'Helpful is my middle name'. These are big achievements. Thank you Jennifer and Ken! The most popular thread this week was our own Marissa Michelotti's post about the new release titled It's a new day for data!. It's not even close this week. The release of Tableau Prep has resulted in a feature faster than any before. With over 131 votes in one week, the idea request Tableau Prep - add ability to schedule flows tops the votes this week far ahead of every other idea. That's it for this week. We hope you are enjoying Prep and all the new features. Renamed the "Community Canvas" area to "Getting Started in the Forums" to address the primary purpose of this location and make for a more unified welcome experience. Moved the Tableau Online forums area to a new home on the Forums navigation to allow for a dedicated location in the forums for users of Tableau Online to ask questions and share resources. And finally, we have cleaned up the front welcome page of the community to focus on the the information you asked be presented in a easy to use front page. We are always seeking your feedback on the community design and use so please feel free to email community@tableau.com at any time. + We are looking for your stories about working with dirty data: How do you deal with dirty data? Tableau Product Marketing Manager Tracy Rodgers has opened a thread in the forums to learn more about some of the frustrations and issues you are running into when you're preparing your data for yourself and for your organization. Check out some of her guiding questions and let it all out! Thank you! + Have you ever helped shape the creation of a brand new product? Now is your chance. Project Maestro Beta #4 is live. Beta 4 is still available for download and feedback! There is still time to join the beta and learn about Maestro before the rest of the world sees it. If you are already in Project Maestro join the Community Group! Project Maestro Join now and be the cool kid on the block when the first release is dropped. + This weeks most talked about thread started with a post from Sameen Majid regarding a topic dear to many long time users of Tableau. Re: 'Total' not showing properly. Ambassador Simon Runc provided a detailed reply with links and background to share how Grand Totals are calculated. + This week the Idea Horizontal Scroll Bar on tables had 12 more votes. This is an older idea that continues to see engagement and highlights the experience difference between Dimensions and Measures in the view. Thank you for those votes and feedback. + Zen Master Allan Walker is going to share his tips for utilizing Mapbox with Tableau in a presentation to the Community this this Thursday morning. Learn more and sign up for the webinar here. + Project Maestro Beta #3 is under way! New features include quick cleaning for string fields, quick filters for date ranges, wildcard union for Excel, drag/drop to add a file connection and more. Check out the Beta. Sign up here and a member of our team will be in touch to support you. + We have three community members that have all hit major milestones this week with the "Help one, help all" badge. This badge is a earned after all replies by a user achieve One Hundred "This Helped Me" clicks by members of the community. Please congratulate Tableau's own Wilson Po and customer Justin Larson and Jayshree Dawrewar for achieving this milestone. Thank you for all your contributions and helping to make the Tableau Community great. The post Re: how to get MTD/YTD/Current Week selections in dashboard posted on February 25th is our most viewed thread this last week.. Community member Kemal Gürler replied with the solution for the poster - Sashank Kammili. Thank you Kemal. This is a great thread to see a method of selecting different to date selection options. Community member Elan Sofer created Ability to join Tableau Server data sources in 2015. This Idea collected 11 additional votes this week.